I’m Sara Thompson and I graduated from MVRHS in May 2013. Though that’s a simple sentence, it’s a little bit more complicated than that. I graduated from the high school when I was 16 and moved across the country a few days after I turned 17, to a place where I didn’t have friends or family, to pursue my passion for metalsmithing. Yes — hammering, forging, soldering, melting, and manipulating metal to craft pieces of wearable art, jewelry, and small sculptures. That’s what I do and have been doing on my Friday nights. It’s what I want to study and do for the rest of my life — crafting metal — learning the way metal behaves. My affinity for metal started when I was 11. I had recently moved from Connecticut to Oak Bluffs and received an apprenticeship with a silversmith, Amy Kirkpatrick, that lasted five years. I learned how to handcraft settings; drill and set pieces (primarily sea glass); polish metal to a high shine; and solder, while observing how Amy ran her own business. After that, I went on to apprentice for a metalsmith, Kenneth Pillsworth, where I worked with an array of metals in his home studio. 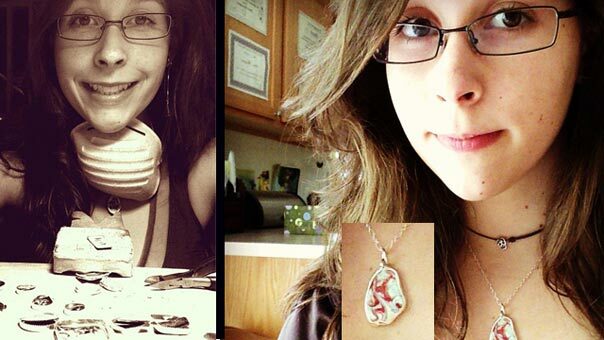 Meanwhile during my sophomore year, I was exploring the realms of a glass on metal technique called enameling. After a short lowdown on how to do this from Brendan Coogan, the crafts teacher at the high school, I gave it a try. There were hundreds of packets of powdered glass — enamel — labeled with different numbers. I took a torch in my left hand, and a steel rod in my right, as if it was a paint brush, and heated up the glass enamel on top of small pieces of copper, from the underside, until it was molten. While the glass was molten, I manipulated the glass with the steel rod as if it were paint. As I repeated this process over and over again, I began to decode the packets. It was captivating, seeing and manipulating variables of the glass, layers of glass, different metals and gauges, duration, placement, and different gasses of the torch. I began to understand how these different variables would affect the piece and how I’d be able to use them to create what I envisioned. Combining the glass and metal resonated for me. When we first see glass, it’s a solid, but flows like a liquid with the influence of gravity while molten. Being a science geek, I wanted to know what are these molecules doing? What is going on this level? I wanted to learn. I started painting with molten enamel on copper. As I explored, I created abstract glass paintings on copper and combined it with my metalsmithing knowledge. I treated the enameled pieces as if they were stones and set the into handmade settings for rings, cuffs, and pendants. Then I started my jewelry business while toying with the idea of graduating high school a year early to pursue a career in metalsmithing. I wanted to learn more and that meant getting off the giant pile of sand. I spent that summer looking at colleges, working and apprenticing full time, and working on my business and online shop. Though I had one thing up my sleeve — I knew I wanted to do metalsmithing and I was going to do metalsmithing. I believe 50 or so colleges offer metals/jewelry as a major, so that was a big help. The next year in my junior/senior (take your pick) year, I tried to apply to college without a GPA, rank, or an SAT score. (Honestly, it’s art school where SAT scores tend to be optional.) I only wanted to apply to two schools. One of them was California College of Art, where hopefully I could double major in metalsmithing and glass blowing (I hoped to have the opportunity to try three dimensional glass work and continue to learn how glass behaves) if the money panned out. And I applied to Oregon College of Art and Craft, which does not have glass blowing, but does have a small — roughly 150 people — and incredible community of talented artists dedicated to not just art, but craft — the skill of making. From the first time I wandered onto their website, I felt that this is where I would feel at home and be able to explore my deeper connection to the artistic expression and hone my craft. This is my new home, in Portland. A place of cozy drizzly days in the studios and in cafes reading about science. Really, you can go to a coffee shop (grocery stores included) and not know anyone. and where escalators still make me feel uncomfortable. Where now, I do art all day, throughout the day, one studio to the next, to another one, to the house (OCAC doesn’t have stereotypical dorms; we have houses) to do art for homework, and pushing myself into areas I would not have gone otherwise. I get wrapped up in the quietness of my mind for hours in the studio wandering the depths and length of mastering new techniques and understandings with the occasional fix of a science related jigsaw puzzle, books, and weekly science magazines. See a video of Sara making jewelry here.